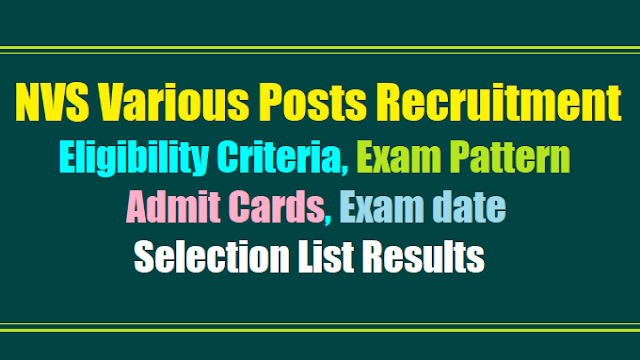 Navodaya vidyalaya Samiti has given theNVS Teaching, Non Teaching posts 2019 recruitment notification and online applications are ivited to fill up 251 vacancies (tentative) of various Teaching, Non Teaching posts of Vidyalaya cadre. NVSTeaching, Non Teaching posts Recruitment test Exam pattern details are given here. Jawahar Navodaya Vidyalaya Recruitment/Navodaya Vidyalaya Samiti Recruitment /Navodaya Vidyalaya Samiti, an autonomous body under the ministry of Human Resource Development (HRD), has released notification for the recruitment on various non-teaching posts. The total number of vacancies available are 683. The detailed advertisement is available on the Samiti's official website. The application is also to be filled in the online mode from the Samiti's website. Selection will be based on the candidate's performance in a computer-based test. Step 3: Follow the link on the main page that says "Click here to fill online application for non-teaching posts of NVS/JNVs under NVS Recruitment Drive 2019". Candidates who apply for the exam will have to appear in a computer-based test (CBT). The exam will be of two and half hours duration and will be of 100 marks. Questions would cover subjects including Hindi, English, mental ability, reasoning, arithmetic, general awareness, current affair and the candidate's chosen subject. Navodaya Vidyalaya Samiti, henceforth mentioned as NVS is an Autonomous Organisation under Ministry of Human Resource Development, Department of School Education and Literacy, Govt. of India having its HQ at NOIDA (Uttar Pradesh). It has 08 Regional Offices at Bhopal, Chandigarh, Hyderabad, Jaipur, Lucknow, Patna, Pune & Shillong and more than 600 Jawahar Navodaya Vidyalayas which are co-educational, fully residential schools up to Senior Secondary Level and located mainly in rural areas, all across the country except in the State of Tamil Nadu. NVS invites online applications from Indian citizens for recruitment to various Teaching, Non-teaching posts. Part-Ill Language test (General English and General Hindi - 15 marks each subject) 30 30 without any time limit for each test individually. in academic institutions test individually. The difficulty level of the question papers for PGTs will be of Post Graduation standard. 180 Marks/ 3 hrs. (i). Schedule of examination will be intimated with the Admit Card. Detailed examination schedule will also be notified on NVS website www.nvshq.org / www.nvsnt2019.org in due course. (ii) There will be no negative marking. (iii) Test Paper will be bilingual: Hindi & English. (iv) Candidates will be shortlisted for admission to online Computer Based Test (CBT) based upon information provided by him/her. It will be sole responsibility of the candidate to prove his/her eligibility w.r.t. qualification criteria advertised by NVS. (vi) Final selection will be through online Computer Based Test (CBT) for post code number 01, 02, 03, 05 & 08 and for post code number 04, 06 & 07 through online Computer Based Test (CBT) and subsequent skill test (only qualifying in nature). b) In case of tie as mentioned at (a) above, the candidate with higher percentage pass marks in qualifying examination, as per eligibility criteria, will be placed higher.